Saab Power Plus Ford Body Equals One STUNNING Drift Rod! 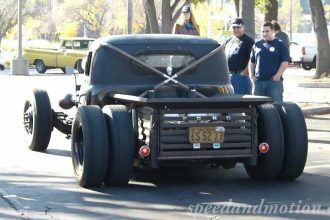 Rat Rod culture is not big in UK, but this car might be all that it takes to turn things around. This guy wanted to build the ultimate fun machine, and we can honestly say – mission accomplished! He mixed a lot of things, including the engine from Saab with the Ford body, and we’ll let you be the judge of the final outcome. Check out this amazing ride in the video below.